Cornish sailor Susie Goodall must wait until at least Friday to be rescued after her boat was destroyed during the Golden Globe Race. Goodall was 2,000 miles west of Cape Horn as a storm caused her to lose her mast when the boat was turned over end-to-end by a huge wave, the size of which has not been confirmed. She told race control that she was knocked unconscious for some time after being thrown across the cabin, she is also believed to have suffered multiple cuts and bruises. 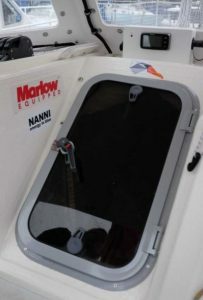 The 29-year-old set off from Falmouth this summer to compete in the 30,000-mile race as the youngest and only female competitor in the competition. She was placed fourth in the current standings when the storm hit and caused her exit from the competition. The distress call was first picked up by Falmouth coastguards, James Instance Duty Controller for HM Costguard said the call was picked up just before 10:40am on the 5th December. The nearest vessel was alerted but it is believed to be around two days away and is expected to arrive at 5:00am on Friday, leaving her some time to survive alone. The Golden Globe Race is an individual voyage in which Sailors must use pre-1988 boats smaller than 36-feet in length and they must complete the trip without using any modern aids such as GPS. This year’s race started on July the 1st when 18 competitors took sail from Les Sables-d’Olonne in France with the competition estimated to take nine months. British sailor Sir Robin Knox Johnston is the only person to finish the race when it was held back in 1968. She is not the first competitor who has required rescue during this year after Indian sailor Abhilash Tomy was rescued by a French fishing vessel despite sustaining serious back injuries when his boat rolled 360 degrees. Susie seems to be in okay health and has been tweeting since the incident saying she is ‘in need of a good cuppa tea’. 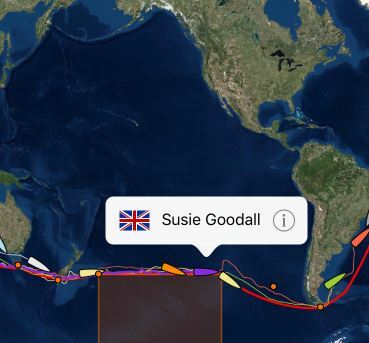 Susie Goodall’s current location (Purple).